Having a data analysis background, I find great pleasure in diving into the sales history in local markets and tracking changes. Instead of being caught off guard when the market starts to shift, why not be far ahead of it!? There are a few different ways real estate agents can look at data to see if there are overall market shifts in the area. The absorption rate in a nutshell is simply the amount of inventory purchased (absorbed) by buyers in the current market. The actual number or rate tells us how much inventory is on hand at any given time. If the absorption rate is 30 days then can expect current inventory to disappear in 30 days. There are many ways to calculate an absorption rate and you can change the result to be in days, weeks, months or years. In vacation home markets or in higher price bracket markets (multi-million dollar properties) you will likely want to show absorption rates in terms of months to years not days or weeks. In order to build these trending reports, we must take a snapshot in time of the data on the 1st of each month. 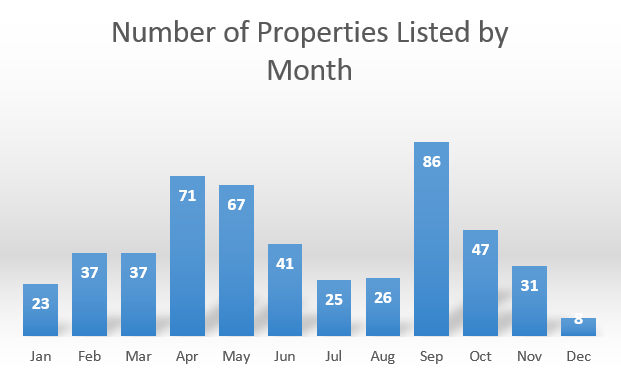 Once we do this, we can start to compare how many properties are on market vs how many properties were recently absorbed in the past month and come up with the absorption rate. What you will notice above is a chart key that explains what determines a seller’s market, a neutral market and a buyer’s market. If a real estate agent tells you that you are in a seller’s market – ask them why? From a data perspective, when we see 3 or less months of inventory we are in a seller’s market. In the city chart you see above the excel cells light up red when we are in a seller’s market and you can see that book Brookline and Somerville spilled over into a neutral market in September. Does this mean we have a market shift away from a seller’s market? Well that is a complex question actually. Momentarily and in this snapshot of time, the answer is clearly yes. But what we have not taken into account is the seasonality of how inventory moves in our New England markets. So how do we determine full market shifts? Data is the answer. Taking these monthly snapshots over time, going back years and years, we can start to see patterns. We can see how September of 2018 compares to September of 2007 or 2011 and see if are seeing similar shifts as we did then. Another very useful way to analyze housing data is to look at how properties are appreciating or depreciating over time. Do we see a slowing down in rates? A good example is in the chart below. 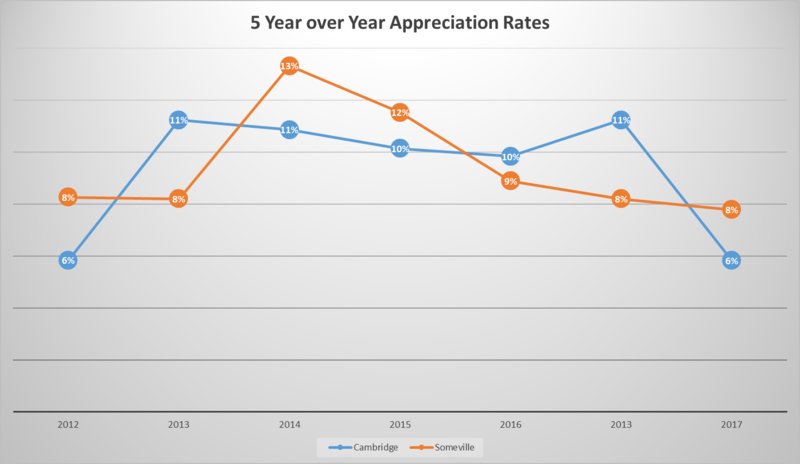 We see Cambridge at 6% appreciation rate in 2012 which was the all time lows for interest rates and a great time to start buying up properties. We then see a pretty steady 10-11% appreciation year over year until 2017 where the rate drops back down to 6%. Could this be an indicator that the hype we’ve been seeing is starting to cool off? I would argue that more years will help us see if that is the case. If 2018 also poses a lower appreciation rate near 6% then yes we are starting to see a cool down but still 6% is a very healthy appreciation rate overall and for sellers there is nothing to be too concerned about. Data is not everything. As much as I love to lean on data for market insights, experience also has a piece of the puzzle which is why working with your real estate experts will help you understand what is occurring in the market now. Our team is starting to see multiple offer scenarios all under asking in strong markets, we are seeing no offers where multiple offers were previously expected and sometimes we see fewer offers than expected. So are these all signs of shifting? Of course they are, when we start to experience changes in the market first hand, we are experiencing what we are seeing in the data. I would argue however, that data puts us ahead of the game before our experiences hit us in the face. In conclusion, we believe minor shifts are occurring but nothing to be worried about. There are obviously many other variables impacting our housing market which I did not discuss in this blog. The bottom line to understand is that the housing market goes up and it comes down and as long as you can ride those waves, you can invest strategies in each cycle. Not sure how to get started? Reach out to our team of experts. We are here for you.